The bar has been set pretty high after dining at one of the most original and authentic Kushikatsu restaurants in Osaka. If you haven’t already read my review on Yaekatsu, head over after this and you’ll know why. I was all excited about Panko’s opening… being a fan of this Osaka Original and of the Unlisted Collection brand, there was no hesitation… I made a booking (surprisingly easily) and off we went! Located along hippy Haji Lane, Panko exuded a moment of Dotonburi vibe with her screaming red neon sign. The risqué hue continued into the long narrow restaurant that stretches all the way across onto Arab Street. It was simply decked out with an open kitchen on one end and table seating on the other. It wasn’t too busy that Saturday night. Good, I thought to myself… they will cook better without a boisterous crowd! We ordered their special dinner course and asked our friendly server to recommend a few other popular choices. The dishes came at a good pace giving us time to savor every freshly fried skewer. It’s evident Panko had adopted a more sophisticated eating style to Kushikatsu dining , providing different complimenting condiments like salt, lemon and Ponzu together with the usual traditional Katsu dip. Our course started with a cup of assorted fresh crunchy vegetables. Chilled and refreshing and totally yummy with the accompanying miso dip, which was so delicious we asked for seconds! The perfect consistency for dipping or dredging the salad sticks into. Had the right balance of sweetness to savory and a little nutty crunch from the roasted sesame seeds. The second dish, a small plate of sashimi. Nothing wrong with it except I was expecting something “seasonal”. There’s no dispute. You gotta order the prawn at a Kushikatsu joint. Panko’s prawn was so deliciously crunchy we devoured the head like a tyrannosaurus! The meat was firm and fresh but just a tad too skinny! Sadly, after ripping the head off, the entire crust just fell apart! The beef was tender but rather flavorless… the toppings of oroshi (grated radish) chives and spicy ichimi (red pepper flakes) were all you could taste. Salty Herring roe topped with a sliver of Uni. This was a nice blend of flavors despite strong individual taste and texture in each ingredient. I liked how the roe breaks apart in the mouth as the uni melds in. Minced chicken ball with corn… one for the kids, perhaps? Octopus can be tricky and this one fooled the chef that it was still alive! Overcooked and rubbery. Panko’s slim Udon was nicely al dente; the well chilled broth was subtly flavored; the Onsen egg was on point; but the dish just did not do anything for me. The white fish was firm and sweet. As much as I love ladies fingers, the small piece here really didn’t do much for the dish . A good piece of fish and a good sauce, seriously, is all it takes. A foolproof combination. Can’t go wrong with this marriage of juicy Ikura and flaky Salmon! Nice! The Scallop was a little small but its juiciness and freshness made up for it all! The caviar added punch; this was really yummy! Take it in one mouthful or risk the crispy crust breaking away. But beware as its a hot little nugget! Don’t burn yourself!! This was rather enjoyable as well. The asparagus was nice and crunchy, both inside and out. The creamy garlic mayo wasn’t too strong. This could become an addictive finger snack! Can’t deny I did a suspicious eye squint when I read “mochi”, “bacon” and “mentai mayo”! But it got my attention for sure! Think Takoyaki balls! With a crispy crust! This was a winner! Loved the fusion of textures and tastes in this one! Chewy, crispy, salty, creamy, sweet and spicy! That’s a mouthful that (strangely) worked! The sprouts retained its signature crunch and bitterness; the tart tomato sauce screamed Western instead of Japanese! Again, a quick dip in a good Kushikatsu sauce would have sufficed! A must order on the Ala Carte. Fresh, tender, juicy and flavorful eel. Did not even need sauce or lemon or whatsoever! Another must-order! The oyster was super fat and super juicy and super duper fresh! Also nice was this very impregnated Shishamo! The course ended with “dessert”. I had expected more than fruit jello. Like many restaurants, there will be hits and there will be misses. And it’s unfortunate Panko had a number of misses. For me, a good Kushikatsu can’t have its crust falling apart. Not every skewer is popcorn size. In fact, in Osaka, the meats are huge and chunky. And coming straight outta bubbling hot oil, its not advisable to just pop it in! So, if you took a bite off that beautiful piece of fish, the rest of it shouldn’t fall naked. The best part of Kushikatsu is also that delicious dip. Every restaurant, if they’re serious, makes their own. And that secret recipe dip is what keeps people coming or leaving. 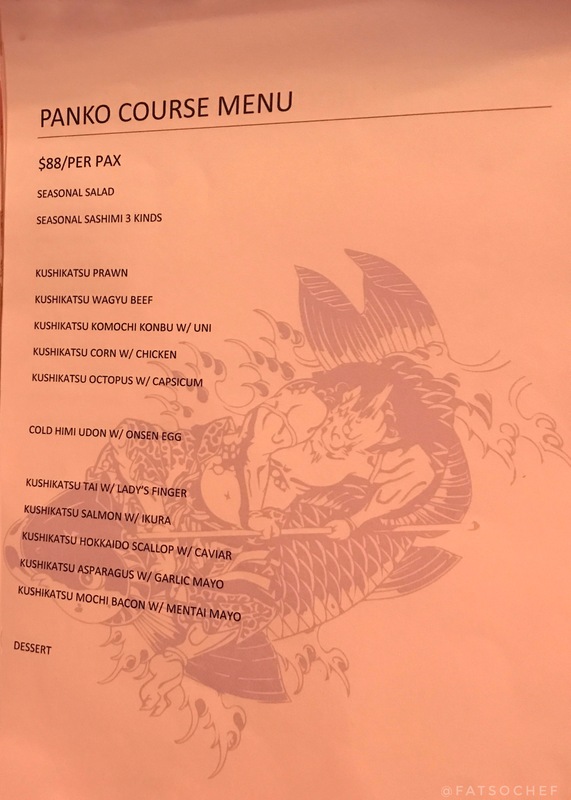 Perhaps I had set my hopes and expectations too high…but it still was good effort on Panko’s part; and a good fried dinner if you’re not too fussy about your Kushikatsu. Next INDOCHINE… STILL GOOD AFTER ALL THESE YEARS!